The Nubian is a relatively large, proud, and graceful dairy goat of Oriental origin, know for high quality, high butterfat milk production. The head is the distinctive breed characteristic, with the facial profile between the eyes and the muzzle being strongly concave. The ears are long, extending at least one inch (2.54 cm) beyond the muzzle when held flat along the face. They lie close to the head at the temple and flare slightly out and well forward at the rounded tip, forming a bell shape. The ears are not thick, with the cartilage well defined. The hair is short, fine, and glossy. Any color or colors, solid or patterned, is acceptable. The Nubian should have the angularity and smoothness of the other breeds; it will have a tendency to more fleshiness, especially in the withers and thighs, and more slope to the rump due to slightly higher hip bones, which may also give the topline a slope downward to the withers. Nubians may appear to be rounder boned than the other breeds. Nubian ears, instead of being short, narrow and alert, will be wide, flat, flared forward at the ends and pendulous. They should extend past the end of the muzzle when held flat along the face. The muzzle should be almost as wide and deep as that of the Toggenburg, and the width between the sleepy, droopy-lidded eyes should be great, but between the eyes and muzzle is a lot of difference. The bridge of the nose should arch severely forward, forming a strong, convex shape, or Roman nose. The Nubian, like the Alpine, may be any color, and the coat will probably be short, fine and sleek. ORIGIN: African and Indian heritage, combined in England. Head: Long, wide with strong jaw; teeth meeting preferred; broad muzzle; arched nose. Ears: Long, wide, thin, hang close to head. Eyes: Full, bright, droopy-lidded “come-hither” expression that fits Oriental head. Neck: Long, lean, blends smoothly into shoulders, brisket, and head; no dewlap preferred. Barrel: Large, deep, wide ribs well spring and sloping to the rear of animal. Heart Girth: Large, wide chest floor, full at point of elbow; shoulder blades blend smoothly and tightly against body; thin withers preferred, but heavy shoulders acceptable; back straight and strong; long, wide loin; long, wide, fairly level rump. Legs & Feet: Wide apart, squarely set, clean-cut, strong, straight; square, straight feet with strong, short pasterns. Coat: Skin loose, thin, pliable; hair is fine and short. Colors: Any color or combination. Udder: Wide, deep, capacious, strongly attached, high in rear, even strong floor, soft and pliable; convenient teat size, well delineated, pointing forward, easy to milk. Conformation and General Appearance: Large, tall, solid, masculine, stylish, healthy. Head: Long, wide, clean, strong, teeth meeting preferred, broad muzzle. Roman nose. Ears: Long, wide, thin-skinned, hang close to head, swing forward. Neck: Long, large, well-muscled, masculine, lean, smooth blending into other parts; fine beard. Body: Large barrel, well-sprung ribs pointing to rear; large heart girth; wide chest floor; full at point of elbow; smooth shoulders; sharp withers; straight back and strong, long, wide loin; long, wide, fairly level rump. Legs & Feet: Wide apart, squarely set, solid, clean-cut, strong, straight; short, strong, pasterns; square, short, straight hooves. Coat: Loose, thin, pliable skin; fine, short coat. Reproductive Organs: Well developed, well attached; two evenly spaced, well-balanced, rudimentary teats. 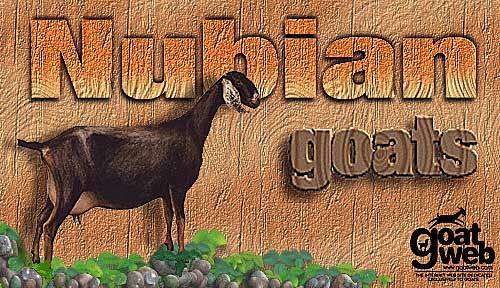 You are invited to join the INBA & keep abreast of all the happenings in the Nubian goat world. We publish an annual membership directory so you can contact others who love Nubians, too. A 40+ page newsletter featuring Nubian goat stories, specialty shows, pictures of top bucks & does, & more is published for members quarterly. We recognize high production records, excellence in linear appraisal, the All-American program & give dam & sire awards.